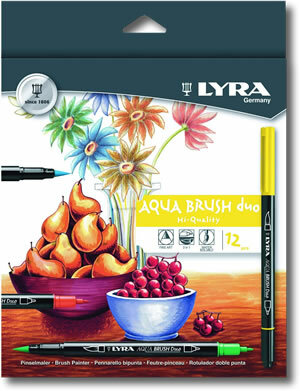 Lyra Aqua Brush Duo is brush pen with a broad tip on one side allowing for brush like techniques and a fine liner on the other it is ideal for all kinds of illustration. The tips are extremely strong and do not fray. The ink is waterbased, can be blended and has great lightfastness.